So I've been following the IF (intermittent fasting) eating template for just about two weeks now. I've got some mixed feelings about it. CON: I feel really kind of restricted by my meal times. The way my schedule works out, I break my fast after I get back from work, around 1pm or so. Because of this, I can't really stop off anywhere on my way - no more river swims or library visits, unless I want to go out later - because I feel like I absolutely have to eat then. I'm sure I could actually go longer without food if I wanted to, but I'm frickin' hungry and really don't want to wait. PRO: I can see a difference. It's a little one, and I can't give any concrete proof of it, as I've stopped weighing myself again (reasons why in this post), haven't gotten my body fat tested since the follow-up of Bonesetter Stew's cleanse dealio, and can't find my damn tape measure. But the difference is there, if (so far) slight. My waist is a little less puffy and my arms are a little more defined. Inner thighs, I'm still waiting on you. CON: I'm almost certain I am more irritable. Maybe Shirtless Man #1 was right, and I should either eat the first meal sooner (putting it right in the middle of the time I'm usually feeding Baby Bug his third breakfast) or have the last one at...11pm. Um, maybe not. Anyone wanna weigh in, especially ladies who've tried IF? Coach TCTH aka Mike K, I know Paul Po would include you in that category, but feel free to offer advice as a dude. PRO: It's fairly easy to follow. There's no weighing or measuring or figuring out blocks, and although Coach TCTH is all finicky about counting calories and I'd probably see results even faster if I did too, I don't think it's entirely necessary. The very act of eating everything within a smaller window means that you unconsciously restrict a bit, or else you'd just be constantly stuffed to the point of discomfort during that time. And that restriction gives me a little leeway to not stick completely to paleo - if I want some cream in my coffee, I'll have some, and not worry about it. So there you have it. It's decent enough, even if the scheduling gets a little annoying. Maybe I should just quit whining and pack lunch. Which I could then eat at the river. I know, I know. Sometimes I astound even myself. But enough talk about healthiness. Today was Saturday, and that means I get to eat whatever I want, whenever I want. And today was, in general but especially in that regard, AWESOME. 6:00am: went running around the Duke Wall with Vivian. Afterwards, we drove to Guglhupf and sat in the parking lot until it opened at 7:30. The cream puffs came out literally five seconds before I got to the counter. 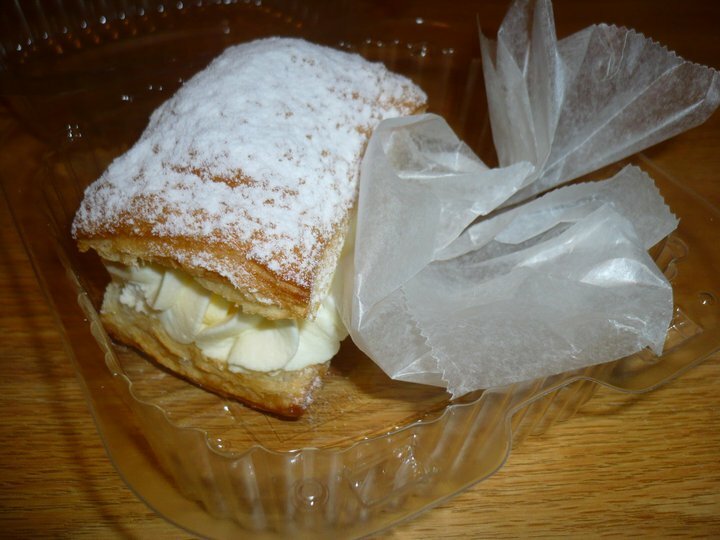 Loaded up with delicious flaky sugary goodness of various kinds, we left feeling supremely satisfied, an emotion that only increased when I devoured said cream puff (the size of my palm!) in the car on the way back to my house. 9:00am: buckets of coffee with cream, plus a chocolate croissant and a butter croissant (the rest of my haul from the bakery; each one larger than my hand). And then a good-sized plate bacon and liver fried up together. And then I realised that was a hell of a lot of food to eat within an hour of working out. Whoops. 10:00am: got to CrossFit, feeling only slightly stuffed. Completed the WOD without puking. I consider this a major accomplishment. Stayed for mobility and then the shoulder health seminar, finally leaving around 2. 2:30pm: a good cup of blueberries (3 for 1 at Harris Teeter!) swimming (and I do mean swimming) in whipping cream. Some leftover salmon. A plum. 6:00pm: a small piece of chicken. Losing steam here. I think I need the mother of all cheat dinners here. Any suggestions? It has to be supremely non-paleo. Chinese takeout is a possibility if I feel like driving and spending more money.